These tender little cookies require no rolling, chilling or cutting. 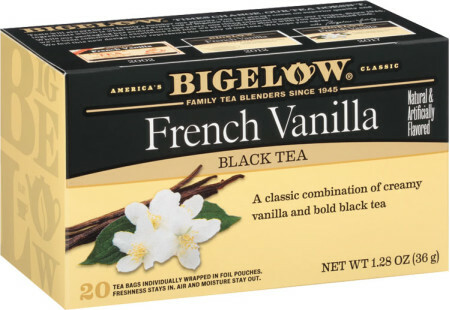 Made with Bigelow French Vanilla Tea, these treats will take you back years ago to Grandma's kitchen. Heat cream in microwave for 1 minute or until it comes to a low boil. Remove from microwave and add tea bags. Let steep for 5 minutes. Squeeze bags of excess cream and set aside. Cream butter with vanilla and sugar until light and creamy. Add egg and beat until incorporated. Sift flour, salt and baking powder. Add flour mixture and cream alternately. Mix well between additions. Preheat oven to 350ºF (180ºC). Grease cookie sheet. Drop cookies, using a teaspoon, onto greased cookie sheet. Bake in oven for 15 minutes. Cool on cookie sheet. May we suggest Eggnogg'n Tea - Case of 6 boxes - total of 120 teabags to pair with this recipe?